Multi Generational Living is becoming very common and one of the considerations which should be made when thinking about a new kitchen. Multi-generational living is for example where young adults aged 21-34 are increasingly moving back into the family home while they save for a place of their own, or where families are welcoming elderly relatives into their homes as a more attractive option to residential or care home alternatives. The kitchen therefore has to cater for people of all ages and handle a potentially bigger family. The result is that two or even three generations often find themselves living under the same roof, each placing different demands on it. Even if you currently don’t have a multi-generational household, there are a lot of design elements that you could benefit from now and in the future when your needs may change. Take a look at our list below and see some examples of kitchen remodels where it’s been done. 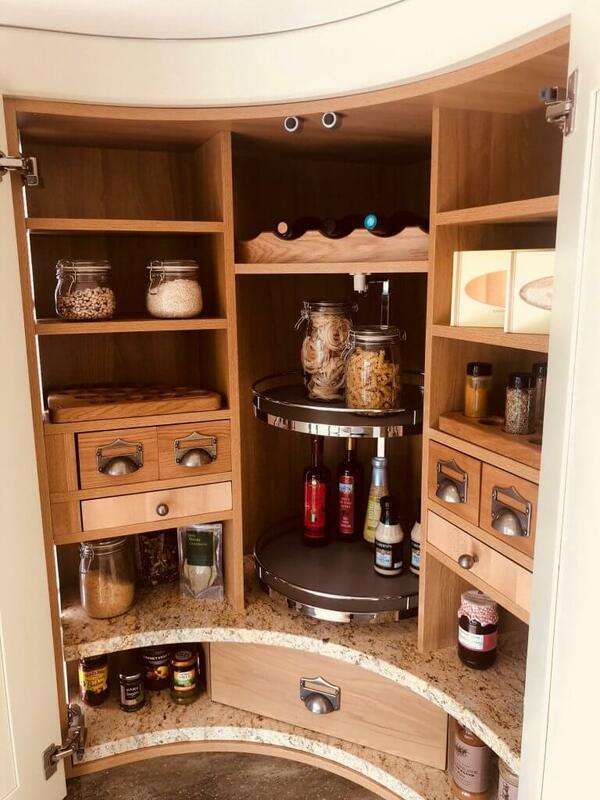 Corner Units: If you have a corner cabinet, the best way to make it more functional is to add a corner solution that will make accessibility much easier for all and allow better utilisation of the corner space. 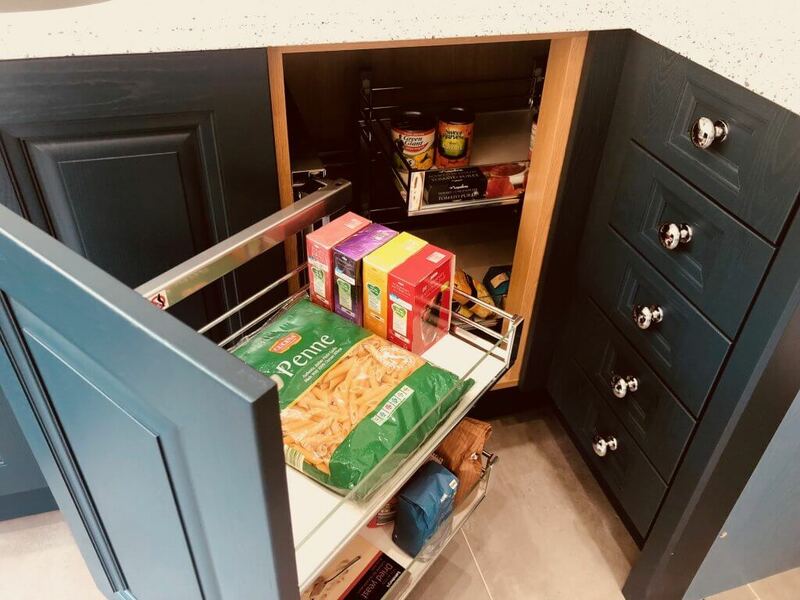 Drawers: Drawers will allow you to see everything thats is inside it makes the kitchen much more ergonomically accessible, where in a cabinet you may have to move things around and bend down to get to the back, draws make much better use of the space. Larger floor space: Floor Space allows for multiple people to use the kitchen, possibly whilst your cooking and the children are in and out of the fridge. Can your floorspace accommodate someone in a wheelchair? The ADA guidelines for a U shaped kitchen is a minimum of 60” between cabinets, walls and appliances; for a galley kitchen the minimum is 40″. Lighting: Lighting is a big consideration ensuring your work surfaces are appropriately lit, but also ensuring your kitchen looks good at all times of the day/night. Entertaining you want your kitchen to sit in the background but have all important mood lighting. Pantries / Tower Systems: Storage is a must for the larger families and having everyones own storage area. Blum Space Tower is an excellent storage solution distributing weight. Pantries with drawers and rotating organizers makes it easy to find things. Organize items so they are easy to find for those who need them. For example: keep snack items and cereals at a lower shelf level so children can help themselves. Kesseböhmer iMove its a great consideration for smaller or elderly household members bringing the wall cupboard to them. Appliances: Think larger washer loads, cooking for more, more than one cooking at the same time. 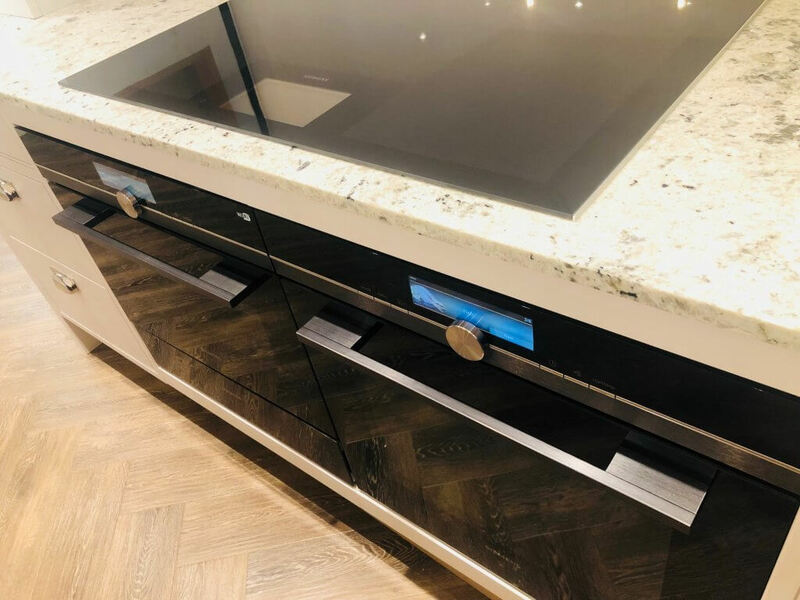 With Appliance features offering solutions such pyrolytic self cleaning saving time and effort and hobs offering assisted cooking, to one push button washing machines making washing simple. Think also technology and WIFI enabled appliances enabling you to turn on ovens etc. remotely, ready for when you arrive home from work. Technology: Technology in the kitchen is here with the help of smart speakers such as Amazons Echo. Many appliances now come with built in WIFI allowing users to voice control and talk to their kitchen from asking it to make coffee’s, to turning on the oven whist your cooking by voice or control the room lighting. Siemens Studio line through Home Connect offers a range of WIFI enabled product. Kitchen Choice: Don’t forget to choose a kitchen which is timeless and will appeal to all family members and last for years to come to ensure all family members enjoy spending time in the kitchen. Our colour creations page will help you mix and match colour choices or one of our trend pages to ensure you stay up to date. Looking to further your career in kitchen design visit our careers page where we have various roles available.